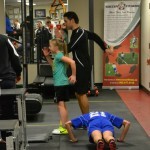 10-Weeks Out Spring Pre-Season Training – Programs starting April 2015! If you are interested, you can print/fill out the Ten Weeks Out Registration Form – Spring 2015 and return it to us to confirm your spot. Soccer Fitness Inc. has been privileged to have been a part of the past three World Congresses on Science and Football, since the 6th edition in Antalya, Turkey, 2007. Earlier this month, we received confirmation that the abstract from our study ‘Effectiveness of Treadmill and Ground Based Over-Speed Training on Sprint Time and High Intensity Running Ability in Youth Female Soccer Players’ has been accepted as an oral presentation at the 8th World Congress on Science and Football, to be held in Copenhagen, Denmark, May 19-23, 2015. This study was conducted using our own unique and revolutionary harnessed high speed running treadmill protocols. In the study, our protocols yielded significant improvements in acceleration and jump height in soccer players.